Strate gives students the opportunity to study design programs from a wide range of design disciplines. It is important to know that all of Strate's diplomas are officially recognized and endorsed by the French State. International students are welcomed to Strate, and we take great pride in having alumni from all over the world. Foreign students interested in studying Design in France can take classes taught in English. We give our students the means to understand what is design and apply its principles during their future careers. If you are interested in studying a transportation design degree, we provide a post-graduate degree in this field. Today, a large number of our alumni work as designers for international car manufacturers. Are you passionate about emerging technologies and how cities can benefit from them? 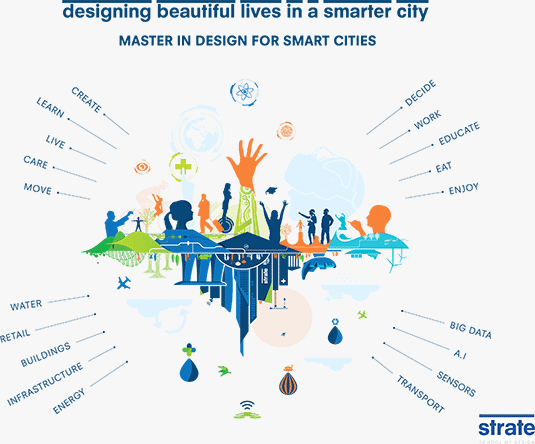 We believe our Master in Design for the Smart Cities will meet your expectations. Both programs are taught 100% in English. Strate is one of the best Transportation design schools in the world. There is not a single car company without Strate alumni. Strate trains transportation designers for tomorrow, capable of developing a transversal and global vision of all mobility issues with a double exigency in terms of formal and conceptual excellence. The Master program is recognised by the French State through its registration by the National Council of Professional Certification (CNCP) at Level 1.